Sampling pure sap from first run. Yesterday we rushed home from work to tap the maples in our little sugar bush before dark. With a forecast of frosty nights in the teens and warm days well above freezing, it made no sense to wait. 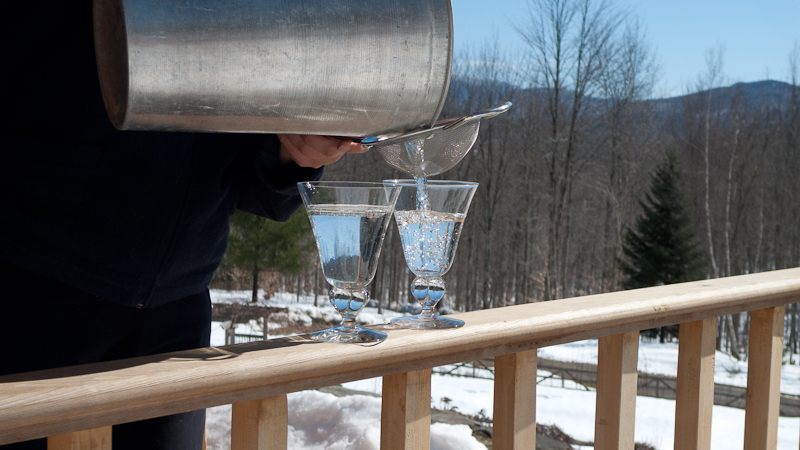 Clear sap nearly poured out of the taps the moment they were inserted into the drilled holes,dropping into the metal buckets —ting,ting,ting —the sweet sound of spring in Vermont. After setting up our 20 buckets in less than an hour and well before nightfall,taking time to admire the golden light in the crowns of trees and the hot pink sunset reflected on the west-facing flank of Mount Mansfield,it occurred to me that our sugar bush is just the right size for us at this time. Any more and it would be a frustrating after-work chore rather than a fun way to tap the joyous energy of this season. 20 taps usually provide a year’s supply of syrup for our needs and for gifts. The daily sap collecting,especially after a long work day and commute,offers a nice bit of exercise. 20 taps also produce just about the right amount sap for boiling off in one day,so we don’t have to boil every waking hour of the weekend or late into the night as you might with with a larger operation. It took a while to figure out the right size and configuration. With a whole hillside of sugar maples available to be tapped,it’s tempting to keep expanding,using tubes and upgrading the boiling rig. We tried tapping trees in various locations spread around our clearing until finally figuring out that it works best to focus on just one small area with the highest concentration of sugar maples and that 20 was the magic number. What a beautiful photo of maple sap,so clear and fresh looking. How does it taste at this stage? It’s like very fresh water. This particular batch didn’t have any hint of sweetness. But when I emptied the other buckets that same day,I tasted the sap from each tree and some had a discernable sweetness and left a slightly sticky feeling on my hands. The sugar content varies by the tree and by the weather conditions. As the season progresses,the sugar content drops and the impurities increase,resulting in the darker,Grade C syrup. I’ve heard there’s a study taking place at the UVM Maple Reasearch Center,right here in Underhill,that is identifying trees producing sap with a higher than normal sugar content,presumably to propagate them for maple syrup production. Perhaps there will also be findings that help us predict which maples in the forest will produce the sweetest sap so we can favor them for tapping and reduce the amount of liquid to boil off.